In art history and restoration technology, infrared analysis has been applied to assess the physical state of a painting, and to determine the existence of underdrawings or over-paintings. Infrared imaging provides a convenient as well as non-destructive way of visualizing the underdrawings due to the low infrared absorption in the top paint layers. This allows explore the underlying structures, outlines and earlier versions. Underdrawings can be observed on several paintings from every era. They are initial sketches which still exist underneath the paint layers, and can be visualized by means of IR-reflectography (Figure 1) (imaging in the short wave infrared). They are usually drawn with pencil, charcoal, or brushstrokes, and are usually covered completely by the later layers of paint. Every artist has his own style and method of underdrawings, from simple outlines to detailed sketches. Hence, details about the creative work process of a painter can be obtained from the underdrawing. With advances in modern IR techniques and instruments, it is now possible to improve the cost-efficiency of this technique, making it more widely available. More sophisticated imaging applications can also be investigated. 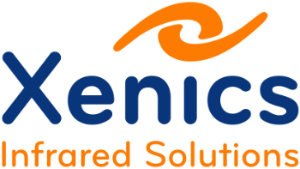 Xenics is a well established and rapidly growing high-tech company about to enter exciting new fields of IR products and applications, serving the markets with excellent products and a strong technology background. This enables us to do custom designed chips and add functionality as requested, such as specific read-out capability. Uncooled InGaAs-based devices will revolutionize the global markets for short wave infrared spectroscopy, imaging and non-contact temperature measurement. Uncooled bolometer-based products will revolutionize the markets for thermal imaging and thermography. While advanced cooled products will continue to grow in the markets that require the ultimate performance level or specialty features. You will see many exciting new applications – commercial, industrial, medical, security-related, scientific, and many others - over the coming years. That's exactly where Xenics is positioned. Thus, Xenics will play a leading role in developing these exciting markets. This information has been sourced, reviewed and adapted from materials provided by Xenics. For more information on this source, please visit Xenics.